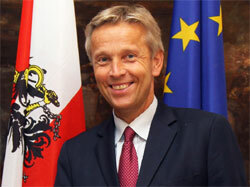 The financial transaction tax, which was urgently craved by the Austrian government, will not be introduced in 2014 already. However, according to State Secretary Lopatka this is not the only bad news since the low interest rates have a negative impact on the capital gains tax where losses will amount to € 500m. Furthermore, there will be losses in the same amount in revenues from corporate and income tax. Moreover, the tax on oil will decrease by € 200m because of the high prices. Only taxes on consumption and wages are in line with the Finance Ministry’s estimates. According to current estimates there will be a shortfall of almost € 2bn. However, State Secretary for Finances Andreas Schieder points out some positive developments: For instance, the Austrian state would pay less for loans taken out than planned. As a result of the budget shortfall the fiscal situation is expected to remain tense. In the next years, further austerity measures are much more likely than tax cuts.